Businesses must comply with OSHA’s Hazard Communication (HazCom) Standard for educating and informing workers about hazardous chemicals in the workplace. This standard covers chemical labeling, safety data sheets (SDSs), hazard classification, and training. HazCom was updated in 2012 to align with the United Nations’ Globally Harmonized System of Classification and Labelling of Chemicals (GHS). This means employers must follow new regulations for the information included on labels, the sections of safety data sheets, and more. If your business needs assistance with HazCom, start by reading our free guide to HazCom labeling. Then take a look at the HazCom products below including industrial label printers for creating your own labels, custom HazCom labels, and educational materials for training employees and helping them follow HazCom requirements. 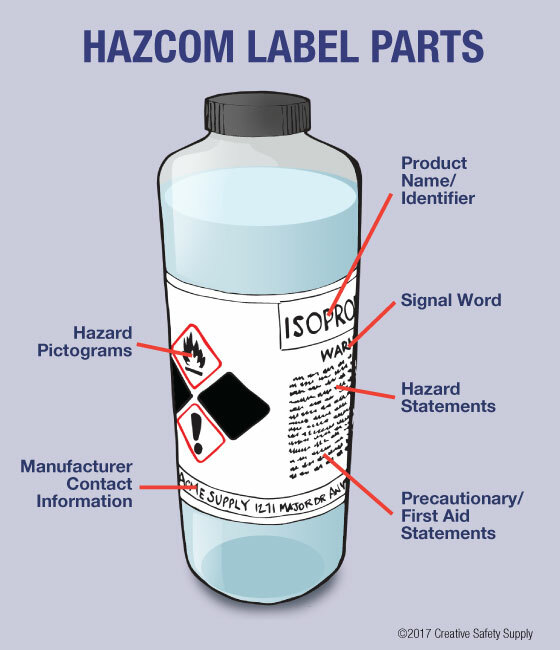 Learn about HazCom labeling requirements and how to create these labels. FREE guide from Creative Safety Supply covering HazCom basics, how to read safety data sheets and labels, and label creation guidelines. Create your own HazCom labels in-house. Print as made HazCom labels as you need with a LabelTac® printer. Choose from our selection of desktop and large-format printers and start making labels on demand. Included software gets you started with HazCom/GHS templates. 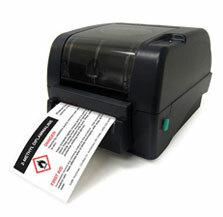 For use with LabelTac® industrial label printers. Print your own HazCom labels with blank HazCom label supply for LabelTac® printers. The pre-printed red diamonds can be filled with appropriate pictograms, and other required information can be printed to the right of the diamonds. Send us your SDSs, and we’ll print labels for you. A simple way to get HazCom labels, particularly if you don’t need large amounts of labels. When you send us the required information about your chemicals, we’ll arrange the information on labels and print them for you. Mark hazardous chemicals with standard pictograms. 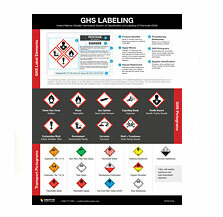 Choose from 9 standard GHS pictograms, available as rolls of stickers. 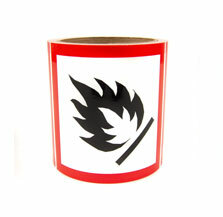 You can add these stickers to HazCom container labels as needed. 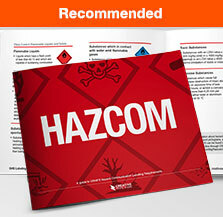 Place posters in your facility to educate people about HazCom and GHS. Posters can also remind people about common pictograms and label components long after initial training. 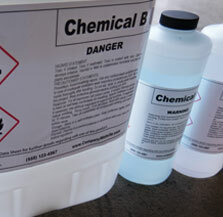 OSHA’s Hazard Communication Standard includes many components of safe chemical handling. These components are all related, and employees must understand each part of HazCom for a business to be compliant with the HazCom standard. This means workers must understand chemical classification, safety data sheets (formerly known as material safety data sheets, or MSDS), and chemical hazard labels. Because of the 2012 adoption of GHS by OSHA’s HazCom, some chemicals may have new hazard classes. At most businesses, employees will need to understand the different classes of hazards so they can take proper precautions when handling chemicals. Each of these groups has further subclasses, and a chemical will belong to at least one of these. For example, a chemical that belongs to the physical hazard group could be an explosive and a gas under pressure (both are subclasses in the physical hazard group). A chemical that belongs to the health hazard group could be a skin irritant and a carcinogen. These are all serious hazards, and when people understand the hazards posed by chemicals, they can behave appropriately. Under previous versions of HazCom, employees could consult MSDSs to learn details about a hazardous chemical. These sheets were replaced by SDSs in 2012. The new SDSs are quite similar to MSDSs, but they have a structured, 16-section format that makes it easier to find the information you’re looking for. These 16 sections are: Identification, Hazard(s) Identification, Composition/Information on Ingredients, First-aid Measures, Fire-fighting Measures, Accidental Release Measures, Handling and Storage, Exposure Controls/Personal Protection, Physical and Chemical Properties, Stability and Reactivity, Toxicological Information, Ecological Information, Disposal Considerations, Transport Information, Regulatory Information, Other Information. The labels can be formatted by a business to fit the space/containers it’s working with, but these six pieces of information must be present on all labels. 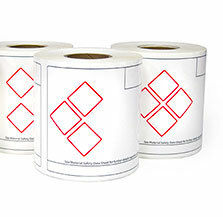 HazCom labels can be ordered individually or printed in-house using an industrial label printer. When many labels are required, on-site labeling is often the best option. All the above written components make up the foundation of a HazCom program, but in addition HazCom training must take place. The goal of incorporating GHS into HazCom was to standardize labels and documents to make it easier to understand chemical hazards, but if people aren’t educated about these new formats, the changes are not be nearly as effective. Plus, OSHA requires that employers train employees about HazCom. To comply with OSHA, all employees should receive training about all parts of the company’s HazCom program and they should have access to SDSs and other documentation in the workplace.